I had a bit of time for a first 2015 render and to try out one of the new models I got from Dante78's store at Renderosity. Here I used the medieval farm building in a late summer kind of setting. I am still trying to figure out the best ways to work with these models, so it is probably not optimal. The materials can be a bit of a challenge because there are very few material zones in many of the models. I might need to take it into another program and define some additional zones to make it easier to use different settings on things (like horses and hay). 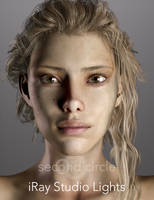 The characters were imported via DAZ Studio. Anyway, happy New Year and happy Vueing!